This past week I had an opportunity to go fishing. 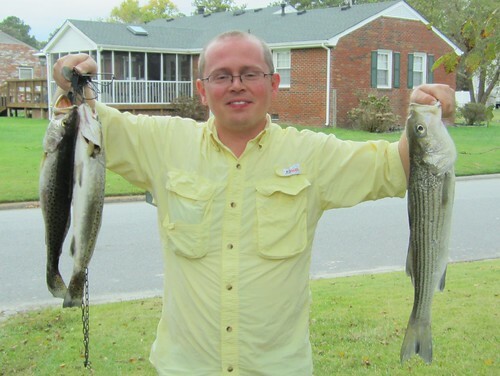 I wanted to bring home a striper, now that they are in season. Opportunities are few and far between, so I take them when I can get them. The weather forecast was poor, rain and storms all day followed by a cold front. I knew that if I wanted to catch much I had to beat the cold front, so I donned my rain gear and headed out. My timing was poor, I missed the low tide. Unfortunately, the tide does not always jive with my job and family! It ended up being a good day anyway. 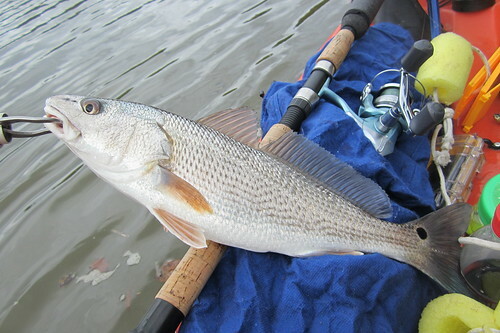 They started out small with this pretty little red drum. 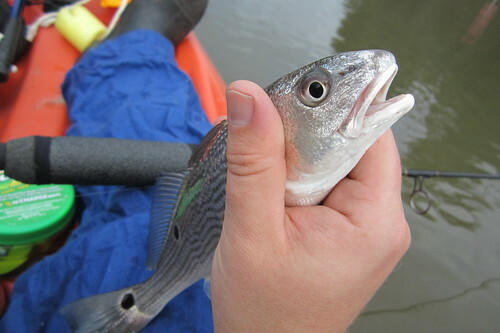 And got smaller with this baby spotted trout. This 18" blue cat put up a good fight. 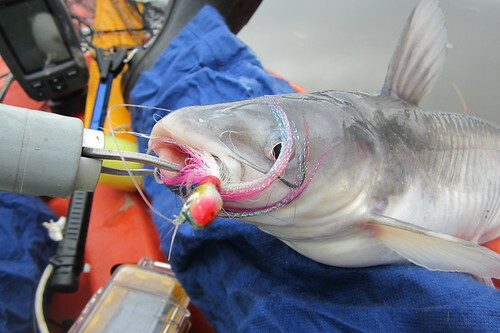 I love showing pictures like this to people who think you can only catch catfish on stink bait. I catch them all the time on bucktails and other lures! 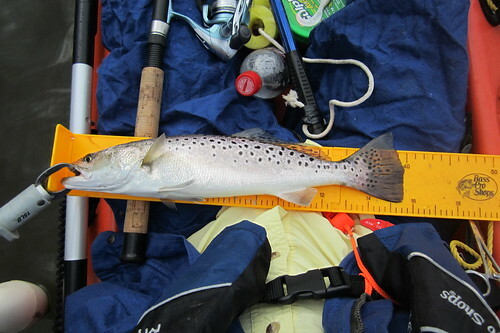 This 17" trout really made my day. I never release legal spotted trout. They are just too yummy. Now that I had two, my wife and I had a good meal. WhooHoo! 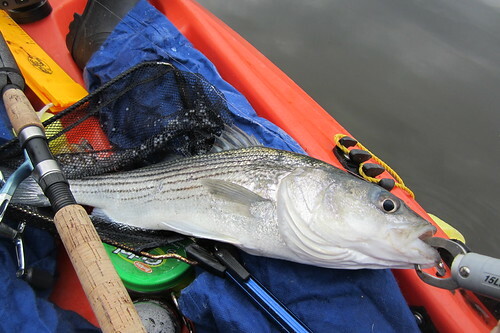 A legal, 20" striper! It was kind of thin and had been recently attacked by something big enough to eat a 20" striper, but it was a striper none the less! It always feels good to catch your target species! 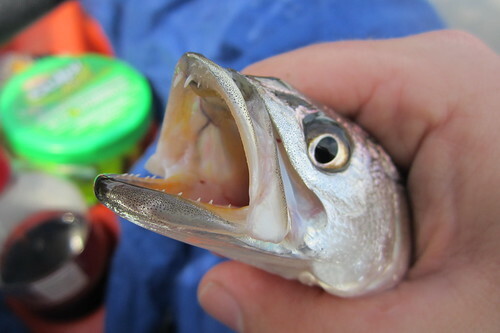 Amazingly, this was a typical fishing trip for me this year. 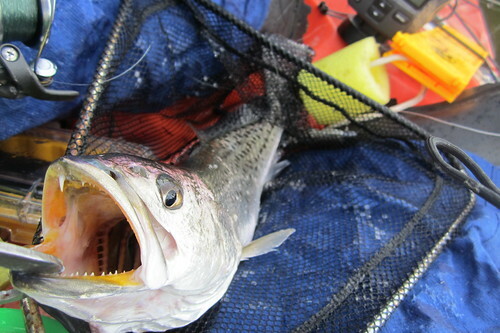 After discovering the joys of kayak fishing and the power of Gulp baits, I have been consistently successful. It feels good to finally be good at fishing!